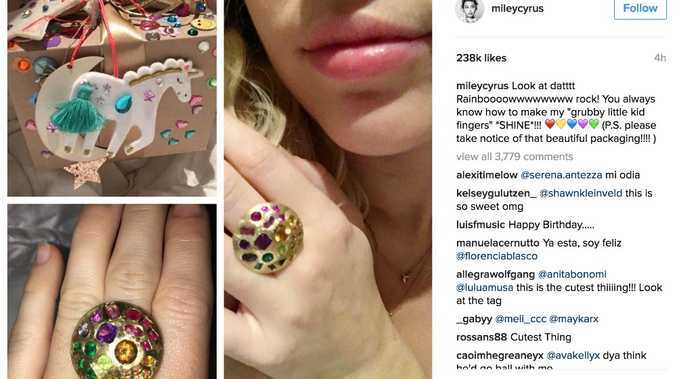 LIAM Hemsworth gifted Miley Cyrus a rainbow ring for her birthday. The former 'Hannah Montana' star celebrated her 24th birthday on Wednesday, and her fiancé has showered her with presents to mark the occasion, including a large ring covered in rainbow coloured jewels. Liam, 26, even went to the trouble of decorating the packaging for the ring, presenting his beau with a box complete with heart stickers and a felt unicorn. Taking to Instagram to post a picture of Miley holding her unopened present, the 'Hunger Games' actor wrote: "Happiest birthday to my favorite little angel! (sic)"
Meanwhile, the 'Wrecking Ball' hitmaker posted a collage of pictures on the photo sharing website, including the packaging and the ring itself. She captioned the image: Look at datttt Rainboooowwwwwwww rock! You always know how to make my "grubby little kid fingers" *SHINE*!!! (P.S. please take notice of that beautiful packaging!!!! ) (sic)"
The 'We Can't Stop' singer also posted a picture of herself from her bed, with a bouquet of brightly coloured flowers and star shaped balloons. She wrote beside the snap: "Best bday evaaaaaa!!!!!!! Thank you my loooooove (sic)"
The news of the new piece of bling comes as Liam's second attempt at buying jewellery for the beauty, as Miley recently revealed she hates her engagement ring. She said: "This is really weird because this is like real jewellery and most of my jewellery is made out of gummy bears and cotton candy and they don't look that good together because they kind of mix up, so sometimes I replace it with an actual unicorn or a Looney Tune. "And he's kind of like what's going on? It's like, 'Well, this isn't really my aesthetic, but I'll wear it because you love me.'"